It all starts at 10pm, Friday Night! 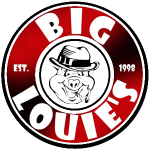 Friday Night at Big Louie’s will be cRazY FUN TOO with Free T-shirts and Free Pass Giveaways throughout the night and in Big Louie’s After Hours, 3 people will compete for $250 in our hilarious “Whack-Your-Mole” Game. Friday & Saturday the 28th and 29thA message from Mark Da Cook!